Many species of predatory wasps build nests from a mixture of mud and saliva. Many are large, conspicuous, black and yellow or black and orange wasps. 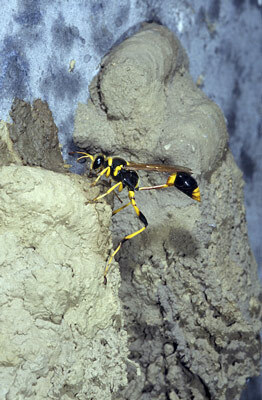 Mud dauber wasps fill their nest cells with paralysed spiders as a food source for their larvae. Potter wasps fill them with paralysed caterpillars. Length to 28 mm. The elongated body is mostly black with yellow patches. The characteristic waist is long and thread-like. Females build mud nests in sheltered situations such as caves, overhangs or even inside buildings. The Individual cells of the nest are flask-shaped and placed in rows. Nests consist of up to three tiers of cells covered with extra layers of mud. The cells are filled with many spiders as food for the larvae. 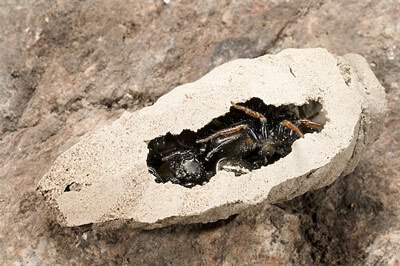 The wasp emits a high-pitched buzz while manipulating mud at the nest. They are found across mainland Australia and in New Guinea and nearby islands. Sceliphron formosum is a similar species whose nest has only one layer of cells and is not covered with extra mud. Length to 30 mm. A robust, mostly orange wasp with a large central black patch between the forewings, a wide black band on the abdomen and orange wings with black tips. Female potter wasps build large mud nests with many cells in sheltered positions. The cells are filled with caterpillars as food for the larvae. They build a temporary entrance funnel while the cells are being filled. The females search for prey around trees and shrubs and use their jaws to cut into the shelters of caterpillars that conceal themselves in rolls of leaves. This species is found across Australia. A female potter wasp, Abispa ephippium.